I've decided to do the ever popular year-in-review blog because I sense the world is just dying to hear from me. Somewhere there is a great demand for below-average running information … and hopefully that somewhere is the internet. Without hurting myself, here are the races I can remember and short blurb on each. Marden Marathon 10K – April 12th. This race is named “marathon” in the classical sense in that there is no marathon distance. However my friend/coach Dave and I cashed in on a 24 hr. sale and signed up for $20/$25 in like December. 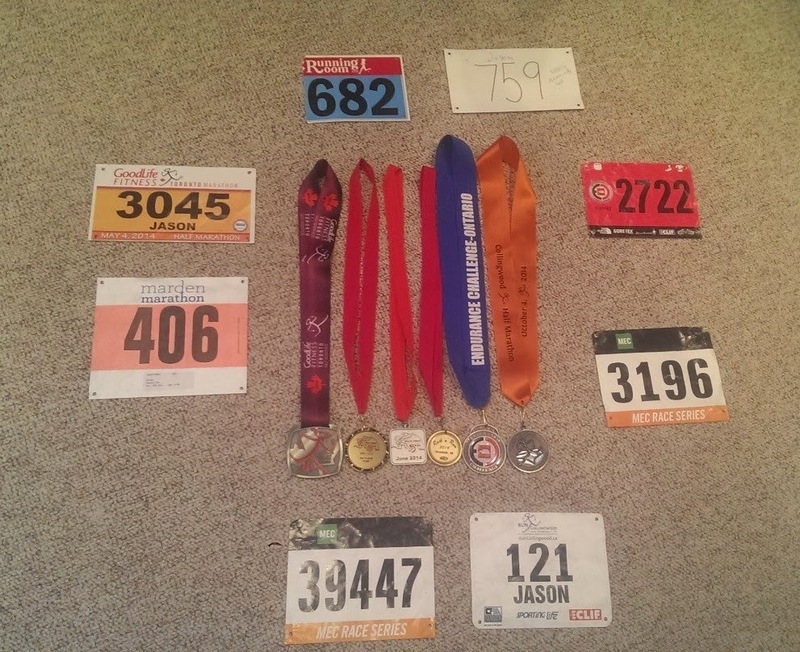 I ran the 10k as a race as a practice in my plan for the half marathon. I ran it in 57:29 which was around my goal but I ran it like a fool. Running too fast, blowing up into walking and then running too fast again, repeat... In the last 2 km I was passed by a guy I saw all day who ran a consistent pace and cranked it in the end, never to be seen again by me. Highlights were great people, well organized, great food and tolerance to post-race beer in the parking lot. Personal Best. Goodlife Toronto Marathon Half – May 4th. This was the race I ran all winter 4 times a week to be able to run. I wanted my first half to be a big event and this was it. Highlights behind the scene had my wife go the wrong way on Yonge Street and rather than see me cross near Bloor she walked 4k herself to get to Wellington before taking a cab to get near the end and running to see me cross the finish line. Highlights for me included convincing a lady coming out of a Starbucks to nearly hand me her coffee because I extended my hand (love Seinfeld) and being beaten by a man in a Batman costume. This big event with kids holding signs and high-fiving runners was a blast. I finished in 2:12.57 which I was really happy with as I ran the whole way minus walking for water in-take and a shoe adjustment. Best thing about first time running a distance … PB! You could say I was beaten by 3000 people in this race but I prefer to view it as beating 1500 people. Mount Albert Sportsday 5k - June 7th. This was the second time at the event as last year this was both my first 5k race and first 5k running at all. If you are looking for a community feel and great organized event then this is it. I sadly will not be going back this year but it’s worth the drive. They added medals this year which is a nice touch. The loot bag, shirt, etc. are great for the price. I encouraged friends Dave, Bryce and Ron to join me in the team competition and it resulted in a win. This is the first time I was allowed to be on a podium legitimately. I ran 27.21 which was a PB and on target. Great food, Newcastle town square finish and family cheering me on during and at the end was awesome. I also met some new NB running Twitter friends: Rod and Joanna Paul. I didn’t PB at 2:17 but I had a blast. The hand written bib was a little comical but due to the inclusion in a new “New Brunswick Challenge” the enrollment to the race apparently shocked the organizers and they ran out of real bibs. 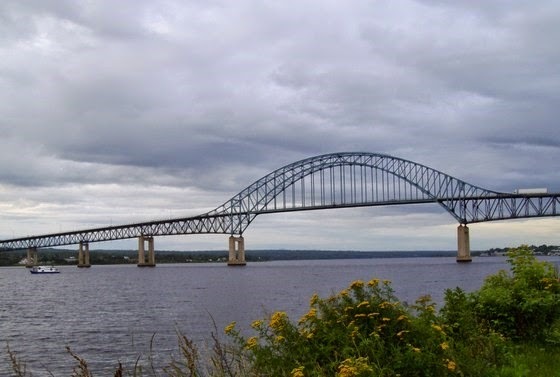 The North Face Endurance Challenge 10k - July 13th. This was the first year for this event in Canada and TNF brought the big hype, big event amenities and pain as promised. It’s at the Collingwood Blue Mountain ski resort. The 10k map suggested 2/3km up the ski hill and then 1km down. So I figured “get through the climb and then turn on the burners as much as you can for the rest”. What I learned was having such a big climb at the beginning makes and rest of the hills on mid-part of the map look small … they weren’t. Collingwood Half - October 4th. I wrote a whole blog on this one. So scroll down if you like. Great event, great people, big hill at 16km and downhill finish. That’s it in a nutshell. I PB’ed at 2:09:30 and was happy with how I ran it. 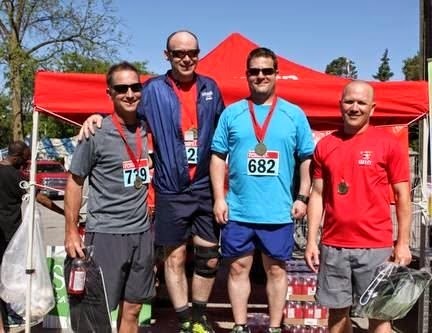 MEC Barrie – Races #4 (15k) and #5 (5k). I blogged about one of these races but can summarize in that this MEC race series at $15 is the by far the greatest value there is in running. Marked and measured courses and food and drink afterwards for $15 is crazy. MEC Barrie will have chip timing next year which I think is additional coolness. 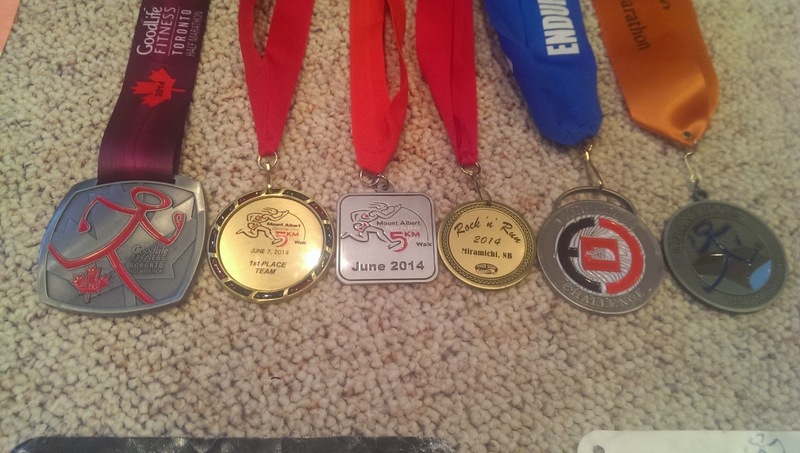 My favorite medal for the years on the left as it was my first half marathon. I worked the longest and the hardest for that one. The Mount Albert medals are great because we actually won a placing in the team event and got to wear 2 medals while drinking parking lot beer. The RocknRun medal had to be mailed to me as they ran out of medals due to a major influx of participants. The TNF Endurance Challenge and Collingwood Half medals are both of high quality and I felt good wearing them while limping to the car. That’s a wrap on 2014! Thanks to the 1 or 2 people who reads this. awesome recap on the year jason! 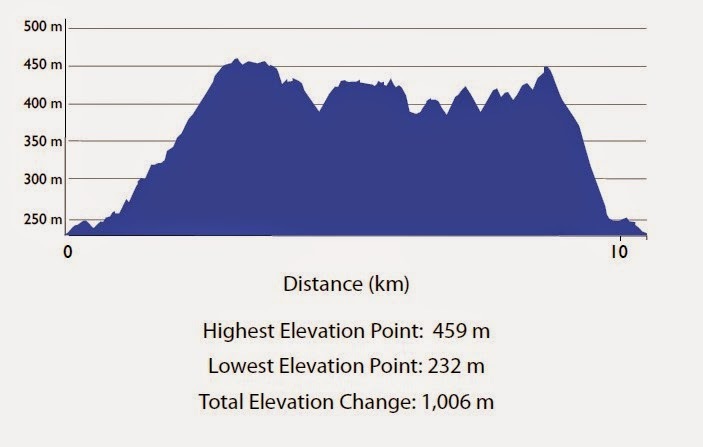 i'm really hoping to give the TNF Endurance Challenge Series race a go this july if they have it again ... thanks for the heads-up on how crazy the hills are! only seeing bigger and better things in the future for you my friend! Thanks Patrick, I am a long way from being 'blogger of the year' ;-) I do hope TNF race is on. I spoke to some racers who ran regular 5peaks races who said it was the hardest race they had run in comparison. Best views from any race. wow! I didn't realize you were in that many races this year. Congrats! Jason! Great stories. Looking forward to many runs together in 2015! 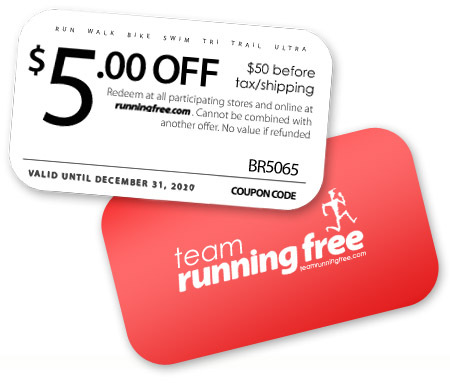 Jack, I am going to see if I can make it work at your race in Stouffville as I know its such an awesome cause and I figure I need to redeem myself after losing to you at the Country Beer Mile 2014.